We Are Scientists, Cymbals, Walking on Cars, Foy Vance, New Sunset Hotel, Ryan Sheridan — among the additions to the lineup for Indiependence 2013 announced today. Joining a host of great international and Irish artists such as Bastille, De La Soul and Kodaline, INDIEPENDENCE is delighted to announce a further bunch of top class acts for this year’s festival. US Indie rockers, We Are Scientists pave the way along with UK indie disco act, Cymbals. The Irish contingent has also strengthened considerably with the addition of Ryan Sheridan, Foy Vance, New Sunset Hotel, Trucker Diablo and a welcome return to last year’s Red Bull Bedroom Jam winners, Walking on Cars. More acts are scheduled to be announced right into July, along with the full Bacardi Oakheart line-up and also several Breaking Tunes newcomers. A first for Indie and a welcome addition to the apocalyptic Darkness arena, the Spoken Word Stage will feature the cream of the crop in spoken word and punk poetry. Headlined by Dundalk troubadour & quintessential Irish punk poet, Jinx Lennon, Indie 13 will also welcome Nagasaki Suntans and some of the leading players in cutting edge performance poetry including slam poet champions; Colm Keegan, Stephen James Smith, Fergus Costello and Abby Oliveira, as well as Cork’s very own punk poet & compere, Wasps vs Humans. INDIEPENDENCE is also delighted to announce that this year’s associated charity will be the Cork Simon Community – Indie13 will make a donation to their very worthy cause. In 2012, one in every four people staying in Cork Simon’s Emergency Shelter was under 26 years of age.The number of young women using Cork Simon’s emergency support services has doubled over the last four years. More and more younger people are staying in Cork Simon’s high-support houses providing round-the-clock care for people with multiple health and related needs. INDIEPENDENCE Music & Arts Festival 2013 tickets are on sale now priced at €79 for three days non-camping and €99 for three days with camping. Tickets are available from www.tickets.ie and usual outlets. Hard Working Class Heroes returns to the streets of Dublin over the weekend of Thursday 6/ Friday 7 / Saturday 8 October for its 9th consecutive year. Taking place in Dublin City Centre the festival is NOW calling on Ireland’s musicians to apply for a slot to play at the event. Applications will be through FMC’s own Breaking Tunes site (log on to www.hwch.net and click on the “BANDS APPLY HERE” button). Closing date for applications is July 16. The judging panel for applications will be made up of writers, A&R and music industry people from around the globe as well as international festival programmers. Once again, Ireland’s photographers are being called on to submit their finest music related shots for a chance to feature in a HWCH Photographers Exhibition. Photographers’ applications will also be via www.hwch.net – simply click on the “PHOTOGRAPHERS APPLY HERE” button and follow the instructions. Keeping up its high standard of additional events and activities there will be the HWCH conference, mentor sessions and band-tips section and more, with a host of international delegates on hand to share their wisdom and experience (thanks to the generous support of The Arts Council and Culture Ireland). As always, Hard Working Class Heroes promises a spectacular collection of music and fun for the whole weekend. ‘HWCH And The City’ proved an amazing success the last two years with bands taking over the city centre in coffee shops, book shops and many more places playing free gigs. The festival website (www.hwch.net ) will provide constant updates on the festival as it unfolds in the lead up to October 6/7/8. Keep an eye on hwch.net for news on exciting new ways we will be involving you. Early bird tickets will be priced at €35 + booking fees compared with the full weekend festival price of €45. Grab them while you can! Offer lasts until July 16th. Cork Opera House is proud to present The Reich Effect a five day festival marking the 75th year of the Pulitzer Prize winning composer, Steve Reich. A multitude of performances including the Irish premiere of WTC 9/11 by the Kronos Quartet will take place in Cork Opera House and other Cork City venues from Wednesday 27 through Sunday 31 July. In order to celebrate this seminal event we are offering an exclusive FESTIVAL TICKET for a limited timeframe only. The FESTIVAL TICKET is a special package of 5 for €100 (any 5 festival events of your choice). Book now to avoid disappointment by calling Cork Opera House Box Office on 021-4270022. The New York Times calls Steve Reich “our greatest living composer” and “among the great composers of the century”, while The New Yorker hails him as “the most original musical thinker of our time”. From his early taped speech pieces to his digital video opera, the American’s path has embraced not only aspects of Western Classical music, but the structures, harmonies, and rhythms of non-Western and American vernacular music, particularly jazz. The Reich Effect will begin with a screening of the film Steve Reich – Phase to Face followed by a public interview with Reich conducted by John Kelly on 27 July in Cork Opera House. Other highlights include the Kronos Quartet (28 July, Cork Opera House), RTÉ Concert Orchestra performing works by Jonny Greenwood (Radiohead) and Kjartan Sveinsson (Sigur Ros) (29 July, City Hall), London Sinfonietta (30 July, Cork Opera House), Efterklang with Daniel Bjarnason and the Messing Orchestra (30 July, Savoy Theatre), Johann Johannsson (31 July, Triskel Christchurch) and Crash Ensemble with Iarla Ó Lionáird and Gavin Friday (31 July, Cork Opera House). Crash Ensemble will perform Double Sextet for which Steve Reich was awarded the Pulitzer Prize for Music in 2009. Local, national and international artists will come together to produce three special programmes of Reich’s music: Counterpoint, Drumming and Phases. These will include two unique dance commissions. David Bolger will dance to Kate Ellis’s Cello Counterpoint and Nic Gaireiss will dance Clapping Music. Both events take place in the Firkin Crane. The Reich Effect is curated by Mary Hickson, Cork Opera House Chief Executive Officer, and the prize-winning cellist, chamber musician, and musician-in-residence in Cork Opera House, Kate Ellis. Budding electronic artists are invited to apply to the Reich Remix Competition. The finalists will be judged and selected by Steve Reich himself, having been shortlisted by a panel of high profile judges including Jim Carroll and Donal Dineen. Reich will also lead a Composition Seminar (places strictly by application). Other events in Cork Opera House, City Hall, Firkin Crane, Pavilion and Savoy Theatre are currently on sale through Cork Opera House. More events in a variety of venues and outdoor sites will be announced. Cliodhna Ryan and Kate Ellis will curate a special programme focusing on the music that influenced Reich himself. Competition winners will be invited to perform at the Remix Club in the Pavilion on Friday 29th July. For application information please email reich@corkoperahouse.ie . Closing date for submissions is 17 June. Composers are invited to learn directly from the master himself. Places are limited and registration is essential. For an application please email reich@corkoperahouse.ie > . This Saturday, 18th June at Bradley’s on Barrack Street, there will take place a tribute to American songwriter Daniel Johnston. At 7.30, ‘Cine-Ceoil’ presents the documentary film, The Devil and Daniel Johnston (110 mins). With Richard Delaney filling in the gaps with his favourite recordings. There is no cover charge. Indiependence 2011: Editors, Ash, Therapy? Indiependence is back for its 6th year and promises to be bigger and better than ever. The festival takes place over 3 days and nights, July 29th – 31st, at Deer Farm just outside Mitchelstown in north Cork, with highlight acts including Editors, Ash, Therapy?, Dan Le Sac vs Scroobius Pip, And So I Watch You From Afar, Whipping Boy and loads more. The festival site is located a 15 minute walk from the town, while camping is available on site with the relevant ticket. Prices start at €59 for two days (without camping) up to €99 for three days with camping. 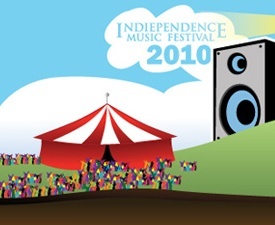 Indiependence 2010 returns this August bank holiday weekend at Deer Park on the old Dublin road just outside Mitchelstown. The new location hosts on-site camping & parking facilities, and will feature 4 covered stages. The stage will see a mix of rock, electro and DJ’s from mid afternoon to early morning. Live music, comedy, DJs, live electro, merchandise, vendors & chillout area. Tickets priced at €59 (or €79 including camping) are available online from Ticketgroup. 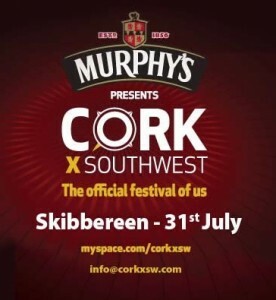 Murphy’s presents Cork X Southwest, in its fourth year taking place at The Showgrounds in Skibbereen on Saturday July 31st. Headliners announced to date include Bonnie Prince Billy and Martha Wainwright. De Barra’s, 55 Pearse st Clonakilty, 023 36549 Wed 6pm – 11pm. Camping is available within the festival grounds for €10 per person. Tickets can be purchased at the gate between 6pm and 9pm on Friday 30th July and from 1pm on Saturday 31st. Ian Whitty & The Exchange, O Emperor, Setmaker, John Blek & The Rats, Travega, 21 Demands, Novella Hermosa, Martin Staunton & The Lost Parade, Jill D. & Gill. 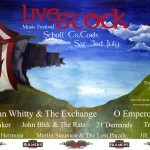 Livestock is a one day music festival which aims to support Irish artists through local festivals concentrating on Music and Art. LiveStock festival has established reputable artists performing alongside new emerging acts offering both the opportunity to showcase there work to a large audience. Ireland has some of the finest artists in the world and we are very fortunate to be able to play a small part in showcasing this talent. 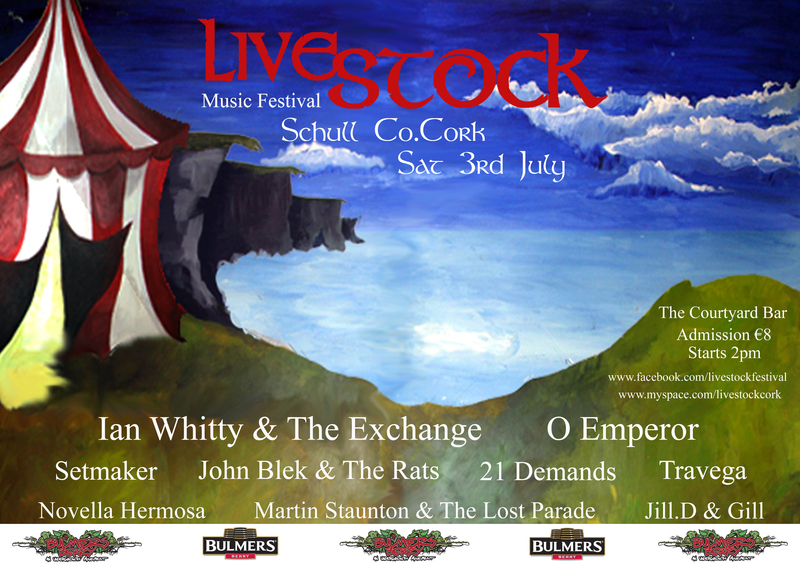 This is the 3rd LiveStock Festival and it has been host to some of the finest acts in Ireland today including most recently, Delorentos, Codes, The Chapters, Ian whitty & the Exchange, 21Demands, T.K.O., The Hot Sprockets, and more. 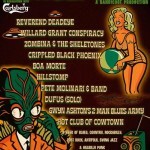 Published on 2 May, 2010 in cork, events, folk, gigs and music. Closed Tags: cork music gigs events folk. Come down and meet the folks is a brand new live music night at Fred Zeppelins in Cork, focussing on acoustic/americana/folk songwriters from Cork and further afield. Each night will feature performances from at least two acts with a special guest host taking charge of proceedings and perhaps spinning a yarn or two to go with a song of their own along the way. The night kicks off on Thursday May 6th, with a feature performance from locally based Louth man Aaron Dillon and Band. “Songs of fear, loss, Religion, Injustice, love, protest, anger and joy. And the voice, poetic flair, melodic sensitivity and lyrical audacity to deliver all those emotions. The music skates on the fringes of numerous genres, folk, rock, bluegrass, pop and blues”. Joining Aaron and long-time collaborator Dave Hackett in their newly begun step up from acoustic duo to full band (Judas! ), will be the established and highly praised rhythm section of Donal Linehen and Shane Murphy (Circus Cat/Together We Are Nobody). Also playing on the night, following his well received recent opening set for Richard Hawley, is Seattle native James Eliot Taylor. James recently released his brilliant debut album ‘Sink or Swim’ as an online only download on the music website bandcamp.com free of charge, and has since followed this with the ‘Parallel Universe’ EP. With both acts clearly bound for larger venues and local folk legend Hank Wedel our special guest host for the evening, this promises to be a wonderful night and modestly priced at a recession busting €5. The night will continue on May 20th with Lynda Cullen and Band and Peter Delaney, where again we invite you to come down and meet the folks. Bandicoot promotions’ Southern Gothic week got underway last night at the Crane Lane Theatre with a late night show featuring Reverend Deadeye. 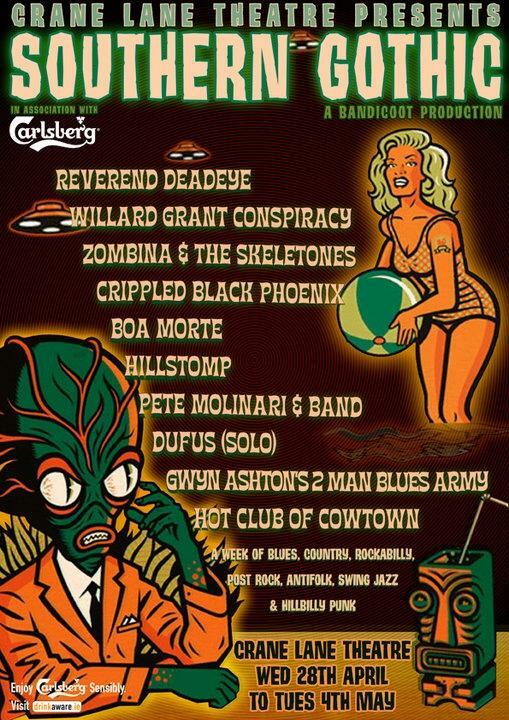 Featuring 10 performers in 5 days, the event is billed as a week of blues, country, rockabilly, post punk, antifolk, swing jazz and hillbilly punk. Read more about it in this article from the Cork Independent. If you have photos of gigs on Flickr.com, tag them 'corkgigs' and they will appear here. Same goes for videos on YouTube.